Join fellow young professionals for great films, in-depth conversations with filmmakers, parties, and other special events that celebrate new voices in Jewish film. See great short films, meet filmmakers, and join us for a post-screening party! Our 8th annual celebration of the next generation of filmmakers! Selected by a jury of young professionals, this year’s program includes short films from Israel, the USA, and the Canada. Six shorts will be screened as part of the 2018 program: America, Death Metal Grandma, The Double Date,The Law of Averages, Open Your Eyes,and Our Heroes. A conspiracy thriller, based on a (mostly) true story. When a group of best friends from the army each begin to fall ill, they suspect that it’s the result of an anthrax vaccine experiment in which they took part during their military service. But when they set out to expose the truth and save their own lives, they find that the roots of this experiment are deeper than they could have imagined. 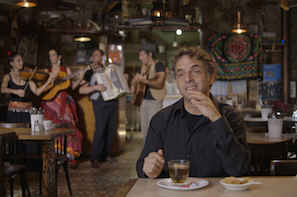 Etgar Keret’s surrealist short stories are read and loved around the world. So, when two young Dutch filmmakers set out to make a film about Keret, they decided to emulate his surrealist style. Through animations of his stories, reenactments of his anecdotes, and interviews with family and friends (including author Jonathan Safran Foer and NPR host Ira Glass), this unique documentary brings to light one of the most renowned Israeli writers of our time. After fleeing their Bedouin village, Rana’s parents moved just three miles away, to the bourgeois Jewish town of Omer. Now, Rana’s mother, facing terminal breast cancer, is determined to be buried in the town where she made her life and raised her children. The documentary follows her family as they try to fulfill their mother’s dying wish. Rana’s parents’ Arab traditions clash with their children’s Israeli upbringing, providing Rana with a lens through which she examines complications of identity and what it means to call a place home. In Biblical times, red cows were sacrificed to purify anyone who came into contact with a corpse. So Benni’s father is convinced his prized red calf will bring them salvation. But Benni, who lives with her dad in an East Jerusalem settlement, feels as lonely and trapped as the calf in its pen. 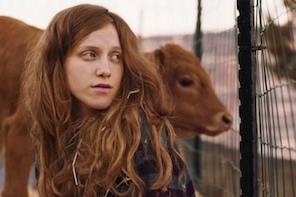 When she meets Yael (Moran Rosenblatt, Apples From the Desert, BJFF 2015), new feelings of longing and desire arise. Increasingly critical of her dad’s peculiar spirituality, she sets out on a personal journey that will shape her religious, political, and sexual consciousness. Menachem was the lead singer of a hit rock band before leaving everything behind to become religious. 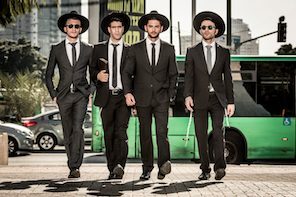 But when his 7-year-old daughter, Geula, becomes ill, Menachem comes up with a creative solution to fund the expensive treatments: getting the old band back together – as a Jewish wedding band. 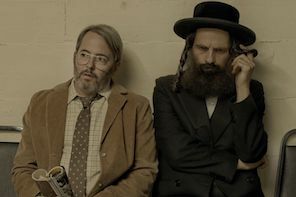 Reuniting with his old bandmates, Menachem struggles as he tries to harmonize his religious beliefs with the allure of music. Redemption exudes a rare wisdom regarding the choices we make to uphold our convictions, let go of the past, and embrace an uncertain future with an open heart. 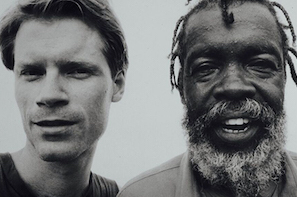 Wandering through Harlem in 1986, Adam Gussow, a heartbroken Jewish Ivy Leaguer with a harmonica in his pocket, happened upon the best blues guitar he had ever heard: Sterling “Mr. Satan” Magee, who once played with Etta James, Marvin Gaye, and James Brown. Satan and Adam, an unlikely pair, quickly became a steady duo on the street outside the Apollo Theater, and eventually, through struggles with the music industry and mental illness, a successful band. Satan & Adam is a 23-year odyssey of music and friendship— across races, classes, and generations. Be transported to Tel Aviv with the shows taking Israel by storm. Join us for an afternoon binge of three TV shows: Shababnikim, Your Honor, and Sleeping Bears. Can’t stay all day? Come for just one show- or two! 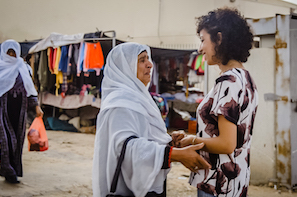 Filmmaker Iris Zaki (Women in Sink, BJFF 2016) rents an apartment and sets up a makeshift film studio in the settlement of Tekoa. She wants to interview the settlers, a group that’s foreign to her and her Tel Aviv friends…but none of the Tekoa residents want to speak to her. Despite their initial suspicion of this left-winger, settlers from various backgrounds gradually open up and engage in honest, surprising, and sometimes funny conversations, providing a fresh take on Israeli reality from both sides of the Green Line. Shmuel (Geza Rohrig, Son of Saul, BJFF 2015), a Hasidic cantor in upstate New York, is struggling to make peace with the loss of his wife. After a series of disturbing dreams, he grows obsessed with how her body will decay and decides he must understand the decomposition process. He calls upon Albert (Matthew Broderick), a community college biology professor, to help him, and the two embark on a darkly comic, macabre misadventure. As their unlikely friendship grows ever more peculiar, this “odd couple” will stop at nothing to satiate their curiosity and, ultimately, to find Shmuel the peace he seeks.